encore Deals! | 50% Off Adult Art Classes at Doodlebug's Make-n-Take! 50% Off Adult Art Classes at Doodlebug's Make-n-Take! Brind some friends and your favorite beer or wine for a fun evening! Make-N-Take is a new local Made-2-Fit-ALL-Ages Arts &Crafts Studio focusing on everyone creating something something while having FUN in a friendly relaxing atmosphere. You don’t need any prior knowledge in painting or crafting. We will provide all the materials and guide you down your path of creativity. You will not create a Picasso or a Rembrandt. What you will do is have fun creating a one of a kind YOU. We are flexible and cater to your needs. Some classes will be all about the children. The projects and atmosphere will be structured just for them. We will give special attention to our young artists and help develop their given talents. We believe art should never be put on ‘the back burner of education”. Of course we have adult-only atmosphere for a fun night. 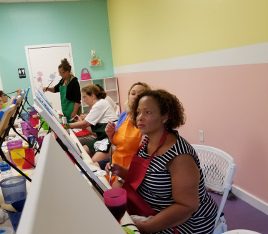 Our Paint-N-Sip is an adult only class. Bring your favorite alcohol beverage. beer. wine but no hard liquor. Soft drinks, tea and coffee are welcome as well as snacks. We have cups and tubs for your drinks. We want to be the place of choice where you and or your children come to paint and create, relax, make friends and have lots of FUN! The Sip and Paint Studios are trending. We are just a bit different offering more than just painting. It is our mission to be best possible painting and crafting venue ever! Come give us a try! Bring a friend or two!